As the Palace of Versailles is just 20 KM from Paris, and such a popular attraction, getting there is quite easy. There are numerous methods of transport from the city of Paris that will drop you off within an easy walk to Versailles. The easiest way to get to the Versailles is by the Paris metro. Take the RER C (yellow) train towards Versailles-Rive Gauche. To get to there, a ticket will cost you approximately €6 round trip, as it is considered a Zone 4 stop. Please note, the RER train is a commuter train, and slightly different than the regular metro line. The Chateau of Versailles is a mere 5 minute walk from the station, and easy to find by following the posted signs. The second best option for getting to the Versailles is by taking one of Paris' efficient buses. Bus number 171 travels from Pont de Sevres (end of Metro Line 9) to Versailles. The bus ride takes approximately 30 minutes. There are several different ticket options to access the Versailles, depending on what you want to visit. This general admission ticket gives visitors access to the Chateau itself but not to Marie-Antoinette's Estate or the Grand Trianon. Reduced entry of €13 is available for museum-pass holders, while children under the age of 18 or students from the EU under age 26 are free. Reduced entry fee is available those that qualify, and students under the age of 26 from the EU, and all other children under the age of 18 are free. From April to October, Versailles puts on a grand fountain show on the weekends. The show is at 11 AM, 3:30 PM, and at 9:00 PM in July and August. Tickets to the show are €8 for the day show and €21 for the evening show. Versailles is open year round, with slightly different hours depending on the season. From the "High Season" that goes from April 1 to October 31st, the palace and grounds are open from Tuesday through Sunday from 9:00 AM to 6:30 PM. During the "Low Season" from November 1st to March 31st, Versailles is open from Tuesday through Sunday from 9:00 AM to 5:30 PM. Please note that Versailles is closed on Mondays throughout the year. Holiday Hours: the Versailles is also closed on January 1, May 1, November 11 and December 25 for holidays. Ready to explore Versailles? 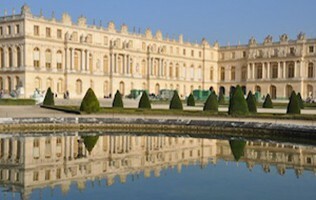 Check out our Versailles Tour!